Wayne Rooney: Could Kane & Alli squeeze England captain out? Roy Hodgson was persuaded to admit that England's superb comeback to beat world champions Germany in Berlin was his finest moment as manager - but has this landmark result also claimed a high-profile victim? England captain Wayne Rooney, out with a knee injury, swiftly tweeted his congratulations after Hodgson's side came from two goals down to win 3-2 in a friendly that will also act as a marker for their Euro 2016 aspirations this summer. And make no mistake, the 30-year-old is a consummate team player. England's all-time record goalscorer will have been totally sincere in his message to the heroes of Berlin. Could the win, however, have less appetising consequences for the man who has been the centrepiece of England's plans since he thrilled the world as an 18-year-old at Euro 2004 in Portugal? Is this the beginning of the end for Rooney? Dele Alli is the precocious 19-year-old from Tottenham who claimed the pre-match headlines by drawing comparisons with the great former England captain Bryan Robson. And yet, as he wore Rooney's familiar number 10 shirt, it was the current England captain whose future came into sharp focus as the teenager, winning only his fifth cap, delivered a man-of-the-match performance. Rooney has been a mainstay of England's plans for 13 years with 51 goals and 109 caps - but as Hodgson's squad flew out of Germany there was a sense he was under greater threat for his place than ever before. England may not be ready to move on without Rooney yet but signs are increasing that this is a squad and a team that is fast losing its once heavy reliance on a player who has served his country superbly. No-one should write Rooney off and it has yet to be proved in the heat of competitive battle that England are better off without him, but Hodgson now has an array of options that would not automatically include their one-time talisman. Harry Kane is a mobile leader of the attack who can play on his own, working in a partnership as well as in the channels while looking as at home for England as he does when leading the Premier League scoring charts with 21 this season for Spurs. 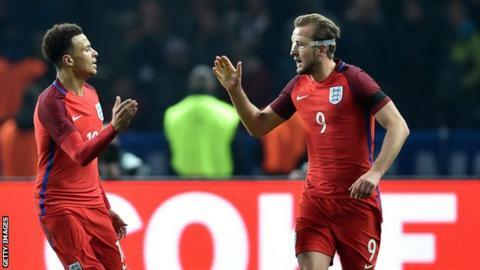 He showed skill on the turn and a clinical finish for his fourth goal in nine games for England to put them back in contention in Berlin - and in Alli he has found a partner and a creator in a link-up that will serve club and country for years to come. Alli and Kane, just 22, seem to spend time naturally on the same wavelength. Alli, as Hodgson pointed out on Friday, can fill all roles required of the modern midfield player. He looked at his best in that number 10 role working close to Kane. He is not afraid to do the dirty business but he is a genuine goal threat as he forced Germany keeper Manuel Neuer into two fine saves. If he was overawed by facing the world champions and luminaries such as Toni Kroos, Thomas Muller, Marco Reus, Sami Khedira and Mesut Ozil, he had a funny way of showing it. It is an enticing prospect for Hodgson and would leave no room for Rooney. With Kane as the nominal spearhead and Alli as the number 10, three would be a crowd. If Hodgson did use Kane centrally and Alli riding shotgun behind, Rooney would be left occupying a wider attacking position. Does this suit him any more? Has it ever suited him? And what about Leicester's Jamie Vardy? Would that wide role not be perfect for him with England? He offers the greatest pace of all England's attacking options - the quality defenders fear most. Any thoughts his confidence in front of goal has waned slightly can be dismissed by the brilliance of his instinctive 74th-minute equaliser, flicked audaciously beyond Neuer at the near post from Nathaniel Clyne's cross. Vardy offers speed, width and goals. And even if he does not start when Euro 2016 gets under way, he is a potent threat off the bench. Hodgson will no doubt use Liverpool's Daniel Sturridge against the Netherlands at Wembley on Tuesday. He is arguably the most talented but by equal measure physically fragile England striker. What has Rooney achieved with England? Arsenal's Danny Welbeck is a sure bet for the Euros on the basis that Hodgson implicitly trusts his ability to offer tactical and attacking flexibility. Theo Walcott was on the bench but he now also faces a fight, along with Arsenal team-mate Alex Oxlade-Chamberlain. And it may not just be injury that leaves Manchester City's £49m Raheem Sterling scrambling for his place on the plane to France. There has even been talk that Manchester United's 18-year-old Marcus Rashford could make a late bolt for the squad - but Euro 2016 has surely come too early. Rooney's fate, inevitably, will demand the greatest attention and scrutiny as Hodgson ponders potentially rich attacking resources. He will, of course, go to France as captain but Rooney is no longer the automatic choice he once was. Does he still offer anything over and above his younger rivals? And Hodgson could yet feel the benefit because it is not in this outstanding player's nature to go quietly or without a fight. Is Hodgson ushering in a new England era? Let's banish all talk of a new England "Golden Generation" - we all know that the last one could not break the 50-year cycle of failure despite containing the likes of Rooney, Liverpool pair Michael Owen and Steven Gerrard, along with Manchester United's "Class Of 92" - David Beckham, Paul Scholes and Philip and Gary Neville. There is no doubt, though, that there is a growing sense that England manager Hodgson might just be on to something special if he can nurture the current crop to allow them to develop their natural ability. England's starting line-up had only 161 caps between them in Berlin compared to Germany's 472. Alli is emerging as the leading light with team-mate Kane a star of the future. Everton's John Stones is still only 21 and will come through a current dark period to establish himself as a defender of the highest standing. Saturday's match-winner Dier, so quietly accomplished as a midfield anchor, is 22 - the same age as Everton's maverick young Ross Barkley, a player capable of becoming a game changer for Hodgson. As well as Kane in attack, there is Rashford, while it is worth remembering Sterling is still only 21 and will fall under the tutelage of Pep Guardiola at Manchester City next season. Arsenal midfielder Jack Wilshere, such a strong influence in Euro 2016 qualifiers, is also on the margins at 24 but he cannot seriously be factored into Hodgson's plans where there is still no sign of him actually playing a game of football because of injury. This does, however, offer an exciting glimpse into England's future and Hodgson seems energised (until the Euros at least) by its emergence. Hodgson was bang on amid the elation of arguably his best 90 minutes since he succeeded Fabio Capello as England manager in May 2012. This was a friendly. England cannot place themselves anywhere close to Germany in terms of achievements. This is a work in progress. England would not get carried away. England's players must remain "hungry and humble". Not the speech of an old sourpuss but the words of a man who will know, deep down, that he has serious issues to resolve for Euro 2016 once the afterglow of this wonderful win has dimmed. England have creaked under the weight of expectation before - indeed they crumbled under the weight of no expectation whatsoever when Hodgson took them to Brazil for the 2014 World Cup and they were out in the group phase. And amid the attacking excellence in Berlin, an old flaw was exposed once more, one that was brutally unpicked in Brazil by Italy's Mario Balotelli, yes him, and Uruguay striker Luis Suarez when they scored in those damaging losses. England's defence still looks horribly vulnerable to high-class opposition and both goals conceded in Berlin were sloppy. The first from Kroos was admittedly partly down to keeper Jack Butland's injury but the lead up was poor, while Mario Gomez's header was a grim echo of the past. Remember how Balotelli escaped Gary Cahill for Italy's winner in Manaus? Remember how Suarez stole in to space to score for Uruguay in Sao Paulo? Too easy - and England's defence, and Cahill in particular, was left in no-man's land again when Gomez scored. England have a soft centre that could cost them against the best. Cahill struggles against quality and Hodgson must hope Stones regains the form that has deserted him. It is no guarantee but Stones and Manchester United's Chris Smalling look his best bet at present. The two full-back slots are also up for grabs despite Clyne and Danny Rose being the men in possession. Not ideal this close to a major tournament. England have impressively only lost one of their past 18 games, winning 14 and drawing three before losing to Spain in Alicante in November. This should not disguise, however, that this was a friendly. Problems still exist, particularly in defence and Hodgson, while rightly delighted, was correct to temper enthusiasm with reality. The real business starts against Russia in Marseille on 11 June. Any lingering fault lines will be opened up if England face's Europe's best in a competitive environment.